Can You Really Make Money Using A Free WordPress Theme? Over the past couple of weeks, I have had many people email me asking if it’s possible to make money using a free theme? Also, I had a few of my referrals over at Wealthy Affiliate ask me the same question so I thought instead of answering this same question multiple times, I would blog about it instead. This way I could refer everyone to this article so they can get this question answered fairly quickly. If you’re new to the online world and are just starting out then chances are that you’re probably using a free theme right now. If you have come to this article then chances are that you may be wondering which theme is the best, Free Or Paid? For those of you who are new, you may be wondering what the heck a theme is and why is it so important to choose the right one? I’ll be breaking all of this down for you guys today and showing you the many themes that I have gone with over the years along with the many mistakes I made and how you can avoid making them. What Exactly Is A Theme? Before we get started today, I thought I would give you guys some insight into what a theme is and what purpose it serves on your website. Your theme controls how your content is displayed and is responsible for the look and feel of your website. This also controls the design of your website and determines how pretty or ugly a website may be. There are literally hundreds of thousands of themes out there for you guys to choose from both free and paid. So which theme would make a good fit for you as a beginner who is just starting out? This is what I’ll be going over in the next section so I highly encourage you guys to pay attention to what I’m about to reveal below. Free Themes Vs Premium (Paid) Themes- Which One Is Better? In my own personal opinion, I actually prefer a paid (Premium) theme over a free one any day and to be quite honest with you guys I actually started out with a premium theme because I quickly saw the value in it. Even though I didn’t know much about this business or how things worked as well as I do now, there is one thing I figured out. What’s that you may be wondering? If you’re serious about building your very own personal brand and showcasing your content in a professional way then having a premium theme is a must for every website owner. However, this is a personal preference and if you’re the type of person who would rather kick the tires and test the waters before jumping in head first then you should start out with a free theme and go from there. 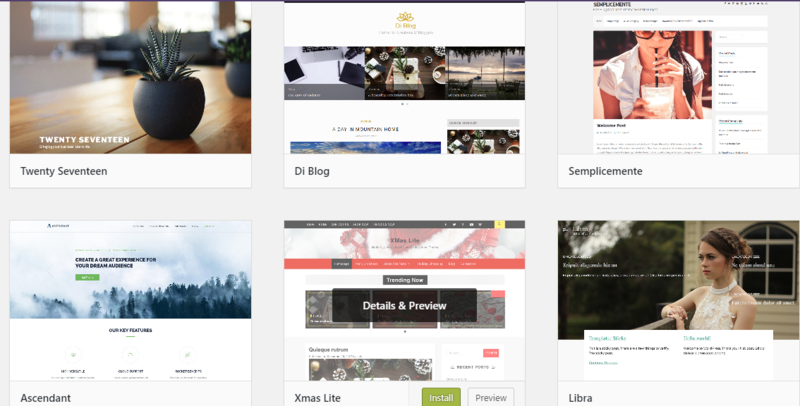 There are thousands of free themes for you to choose from and you can literally be up and running within minutes of installing your theme of choice on your website. What Is Included With A Premium Theme? This is only a few of the many premium features you’ll gain access to when you activate your theme club membership. Just like free themes, there are a plethora of paid themes for you to choose from as well but it’s highly imperative that you choose the one that’s right for your business and overall brand. Many theme memberships run on a year to year basis meaning you’ll pay a flat yearly fee to gain access to their complete library of professional hand coded themes for 1 low price. Which Theme Would Make A Good Fit For You? This is totally dependent on your niche and what industry you’re involved with. If you decided to build an e-commerce website then you might want to check out Woo Commerce Themes to see which one of their themes could be a good fit for your e-commerce business. If you’re more of the type of person who is more into running their own personal blog then you may want to check out some of the themes over at WPLook. If you’re going for more of the niche style blog then you may want to check out the theme lineup of Genesis themes as these are the best themes for these types of websites/ blogs. I have personally used several of their themes on a few of my other websites and I have nothing but good things to say about them. Like I said earlier, this all depends on your niche and whether you’re interested in promoting affiliate products on your site or going the e-commerce route. Can You Really Make Money With A Free WordPress Theme? I know several people who started out with a free theme and actually made their first sale within the first 4 months. These people then went on and upgraded their site to a theme that offered more customization and included a variety of extra features. You wanna know what’s even cooler than that? They went on to be some of the most successful affiliates in the online space and I still occasionally speak with them from time to time to get the scoop on how they’re doing right now. If you’re a newbie who is just getting started online and you’re living on a limited budget then I think starting out with a free theme would be your best option. Need A Hand Getting Your First Blog Or Website Up & Running? Choosing the right theme for your website is a crucial part of building a successful website that will rank in Google and the other search engines out there. However, if you’re a newbie who is just starting out and you don’t have the slightest clue about how websites work or you’re still confused as to what a theme is then you’re going to need some training on this subject. When I first entered this industry back in 2012 I didn’t have the slightest clue as to what I was doing and I had a ton of questions. Thankfully, I was able to stumble across a program called Wealthy Affiliate and this is where I was introduced to the affiliate marketing/ blogging world nearly 6 years ago. Within that time I have not only gained a massive amount of knowledge on this subject, but I have also helped countless other people figure this stuff out and become very successful as a result. If you have been struggling to make money online and you need someone that will be there to help you out and answer your questions then I think you owe it to yourself to check out everything they have to offer you. Other than that, I really hope this post has given you some insights on which theme would be the best fit for you starting out. Have questions on anything I’ve mentioned above or want to contribute anything to this post? I would love to hear from you guys and answer any questions you may have. Leave them for me in the comments below and I’ll get back with you right away with a detailed reply. Previous Post: « CinchBucks Survey Review- How Much Are Your Opinions Worth?